Hotel Blaumar is nestled in the bay of Cadaqués, a town of artists and thinkers. It’s located less than 10 minutes away on foot from the town centre in a very quiet residential area just a stone’s throw from the sea, spectacular coves and superb natural surroundings of the Costa Brava. This small, welcoming, family-run hotel has 27 comfortable, well-equipped rooms with full bathroom (bathtub or shower), most with a balcony and views of the town. 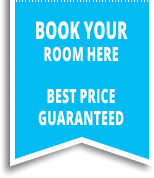 All rooms have air conditioning (summer), heating, telephone, hair dryer, 22'' LCD cable TV and safe deposit box. There’s a Wi-Fi service, bar and cold buffet breakfast. Guests can also use a closed garage and a bicycle hire service. The hotel is a modern, Mediterranean construction with a predominantly white and blue colour scheme. You can have breakfast on the terrace accompanied by a picture-postcard view of the town, and from May to October you can also enjoy the outdoor pool and solarium area. low: March, april and october. mid: May, june and september. high: From 01 to 19 july, rest august and holidays. Form data is correctly sent.